The Tranquility 22 Digital Series is an economical alternative to the TE model for significant energy savings AND unmatched home comfort. 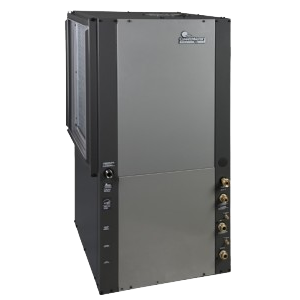 The Tranquility 22 Digital is a game-changing new geothermal heat pump that is the first in the industry to integrate digital communicating controls, vFlow internal variable-speed water flow, two-stage capacity, and variable-speed fan. The system is engineered for quiet, efficient operation and comes in multiple capacities. Extra high efficiency (22 EER) produces significant energy savings. EarthPure Ozone Safe refrigerant has higher efficiencies and zero ozone depletion for unprecedented environmental protection. Two-stage technology automatically adjusts itself to provide the optimum, consistent indoor air temperature regardless of outdoor weather extremes. Automatic alerts, simplified controls, and easy lift-out access panels make it easy to use and service. Tranquility 22 is engineered for safety with compressor, overflow, and freeze protection, plus a shut-down switch and fault lockout.